Qaeda No. 2 Behind U.K. Terror Plot? A Briton identified by Pakistan as a key suspect in the London airliner terror plot has links with an outlawed Pakistani militant group, and interrogations of those in custody indicate al Qaeda's leadership sanctioned the foiled plan, intelligence officials said Thursday. Questioning of some of the up to 17 suspects detained in Pakistan over the alleged plot revealed that al Qaeda No. 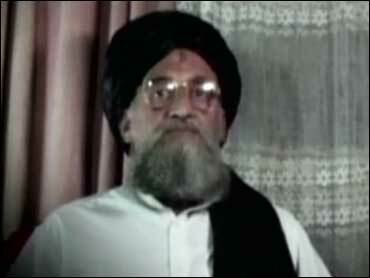 2 Ayman al-Zawahri likely approved the plan to blow up passenger jets flying from London to the United States, a senior Pakistani intelligence official told The Associated Press. "We have reason to believe that it was al Qaeda sanctioned and was probably cleared by al-Zawahri," the official on condition of anonymity because of the sensitivity of the investigation. Pakistan's investigations also revealed that a British national arrested in Pakistan last week, Rashid Rauf, planned the plot and recruited people in Pakistan, the official said. Rauf had also made contacts with people in Britain to take part, he said. He said Rauf was operating under an al Qaeda mastermind whom the official declined to identify. Other intelligence officials have said Rauf had been in contact with the purported No. 3-ranked al Qaeda leader at large in neighboring Afghanistan. Authorities are searching for three more suspects — a British Muslim of Afghan origin, an Eritrean national and a Pakistani — that suspects already detained in Britain and Pakistan, including Rauf, have told interrogators are in Pakistan, intelligence officials said. All the officials spoke on condition anonymity because of the sensitivity of the ongoing investigation into the plot, which has also prompted 24 arrests in Britain and new security measures on commercial flights around the world. Pakistan's government last week identified Rauf as a "key person" and said it was linked to al Qaeda in Afghanistan, but have given few other details, while authorities in Britain have closely guarded information about the investigation. His brother, Tayid Rauf is among the plot suspects detained in Britain. An intelligence official and a relative said that Rauf has links with outlawed Pakistani militant group Jaish-e-Mohammed and is related by marriage to its leader. Hafiz Mohammed Sohaib, who teaches at an Islamic school here in the eastern town of Bhawalpur, told AP on Wednesday that his sister married a man by the name of Khalid Rauf three years ago. Police told Sohaib's family that Khalid was an alias for Rashid Rauf. He said police detained Rauf as he tried to leave the town on a bus to the nearby city of Multan on Aug. 9 — two days before suspects were rounded up in Britain. Bhawalpur, a stronghold of Jaish-e-Mohammed, lies about 310 miles southwest of Islamabad. Several days after his arrest, police commandos and plainclothes officers raided Rauf's home and confiscated a computer and identity documents, Sohaib said. Sohaib did not know if Rauf held British citizenship and knew him only as a seller of refrigerators. Sohaib said his other sister is married to the brother of Maulana Masood Azhar, the wanted head of the Jaish-e-Mohammed, a militant group that fights Indian security forces in Kashmir and has been blamed by India for a deadly attack on India's parliament in December 2001 that almost sparked war with Pakistan. The group has also had links with the Taliban. But a Jaish-e-Mohammed spokesman denied on Thursday that Rauf had ever been a member of the group. "He had never been a member (of Jaish-e-Mohammed). We have not even seen his face," said Mufti Abdur Rauf. Britain is expected to seek the extradition of Rashid Rauf, who moved to Pakistan shortly after his maternal uncle was stabbed to death in April 2002. He was reportedly a suspect in that murder and police raided his Birmingham home as part of the homicide probe. A British district judge ruled Wednesday that British investigators have until next week to investigate 23 suspects arrested in the airline terror plot. CBS News correspondent Charlie D'Agata reports new anti-terror laws give the British government up to four weeks to hold suspects without charges — but lawyers must periodically appear before a judge to make the case for continued confinement. Scotland Yard said Wednesday night that one person arrested earlier this week as part of its investigation was released. Meanwhile, analysts say British Airways alone has lost almost a hundred million dollars over the past week because of flight cancellations, delays and other problems in the wake of the foiled terror plot, reports CBS News' Amy Guttman.